Cape Breton Tourism Spotlight: Come and Visit "Canada's First Heritage Lighthouse" - St. Paul's Light is located in Dingwall, Cape Breton. Come and Visit "Canada's First Heritage Lighthouse" - St. Paul's Light is located in Dingwall, Cape Breton. Many visitors coming to Cape Breton really enjoy taking pictures of lighthouses around the island. And I would like to mention that Canada’s First Heritage Lighthouse is located in Dingwall, Cape Breton. Just minutes off the world famous Cabot Trail, you will find Canada’s first and only federally designated “heritage” lighthouse on any of Canada’s three oceans. Built in 1915 and relocated to Dingwall in 2010, the St. Paul South West Lighthouse is also the first cast iron lighthouse constructed in Canada. The lighthouse is a standing tribute to the Light-keepers and their families. Climb the stairs and view the rotating clockwork and rare Fresnel lens. Step back in time to when seamen and vessels relied on lighthouses for navigation. Experience what life was like on an isolated island. The storms and hardships that the families faced by hearing their stories and viewing the artifacts in our museum located beside the light house. 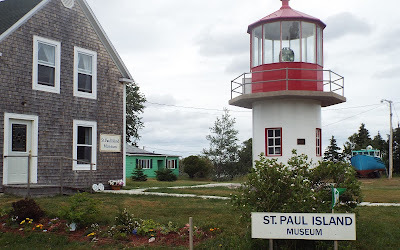 The St.Paul Island Museum & Light house located at 575 Dingwall Road, Dingwall, N.S. B0C1G0 is just 3 minutes off of the Cabot Trail. The Gift shop, Museum and lighthouse are open seven days a week from 10am to 5pm through June until after the Celtic Colours Festival in October.